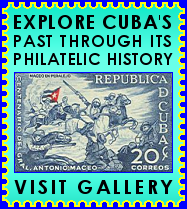 Welcome to ILAstamps.com, dedicated to Cuban philatelic items from 1855 to 1960. We currently have over 3,000 items listed for sale: stamps (mint, new, and used), blocks, sheets, FDCs, covers, postcards and more. Check back weekly for new items. We also have selected topicals, such as Firsts, FDC's, Pre-Columbian, Columbus, Tobacco, Boy Scouts, Lions Club, Rotary Club, Red Cross, World Cup, Marine Life, Collections, Postcards, Books, Cubania, among others.